JANUARY 1995: After eleven days on the highest peak in South America, three alpinists descended through the heart of a storm. Deep drifts of snow had slowed their progress up the South Face of Aconcagua, 3000 meters of steep ice, hanging glaciers and fragile rockbands. This imposing wall was legendary for avalanches that thundered down its ramparts and for the viento blanco that brought sudden blizzards and intense cold. Days earlier, they had consumed the last of their food and fuel. Finally, only the Corsican climber Pierre Griscelli had the strength to continue. Seeking help for his friends, he got lost in the dark, and two more days passed before he could alert search and rescue. Meanwhile, wind and snow pummeled the tent where his companions huddled. At last, they tried to descend on their own, only to collapse in the snow. One of them, Celine Rambaud, would survive, with severe frostbite. The rescuers did all they could to comfort the man who had tried to keep her alive, but he died in their arms. His name was Hugues Beauzile. He was only twenty-eight years old. THOUGH FEW MAY REMEMBER HUGUES outside of his own country of France, he was briefly one of the most promising young alpinists in the world. In February 1995, his longtime girlfriend, Laure Loubier, traveled to Chamonix to receive, in Hugues's name, the "Cristal" award from the Federation Francaise de la Montagne et de l'Escalade for his roped-solo ascent of the Tomas Gross route on the Aiguille du Dru, one of the hardest big-wall climbs in the Alps—which Hugues had completed not quite two years after putting on crampons for the first time. To many journalists and established French mountaineers, Hugues was a mysterious figure who had emerged, quietly and unexpected, against the background of vast alpine faces. Caught on camera by accident as media helicopters flew after other, more famous climbing stars, he'd appeared in a remarkable flash of talent and skill only to vanish in what seemed like an instant. Nonetheless, traces of his presence remain embedded in the memories and imaginations of those who knew him best, and his legacy has continued to inspire alpinists of a new generation who might never know his name. LIKE MOST MOUNTAINEERS IN THE US, until a year ago, I'd never heard of Hugues Beauzile. Fans of the famed American climber Lynn Hill may recall the final chapter of her memoir Climbing Free, when she describes how Hugues and her brother-in-law Chuck Bludworth died on the same mountain more than twenty years apart. 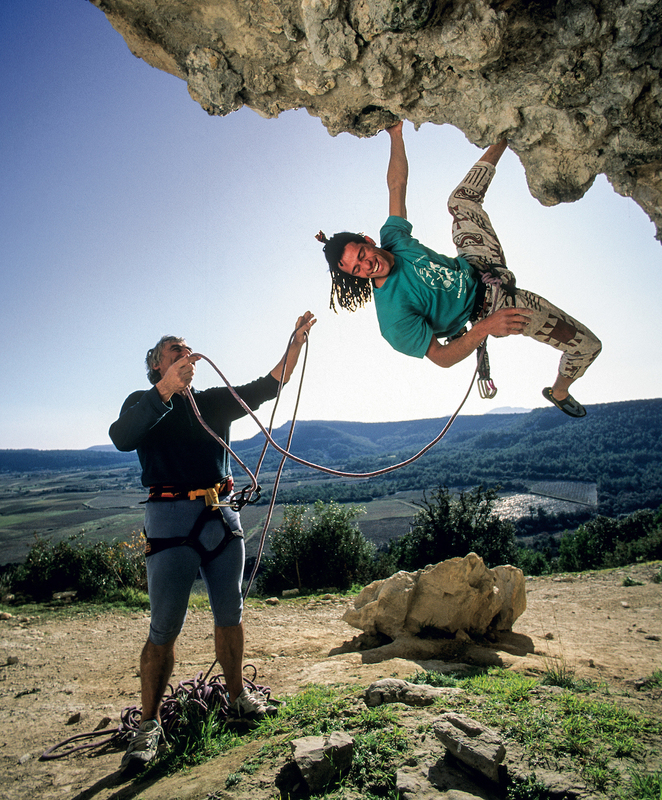 Lynn and Hugues had become friends during a visit she made to Claret, his home crag, in 1993. In January 1995, she recounted, "I woke up disturbed by a strange dream. In this dream, I looked down from the sky on a huge snow-covered mountain. A cross lay flat against the snows near the summit. White lights surrounded the cross." Soon afterward, she learned that Hugues was gone. But where did he come from? The son of a black Haitian father and a white French mother, Hugues was born in the village of Jonzac near the southwest coast of France in 1967. He was just a year younger than I am, and we began climbing about the same time, in 1989. More than two decades after his death, I feel honored to discover such an accomplished adventurer who shares my African heritage. People of color rarely appeared in the European and North American mountaineering literature of the last century and in the books and magazines I read growing up. I hope that today's young climbers—Kai Lightner, Ashima Shiraishi and many others—can find connections to their own history, heritage and legacy of adventure in the memory of this talented and giving man. 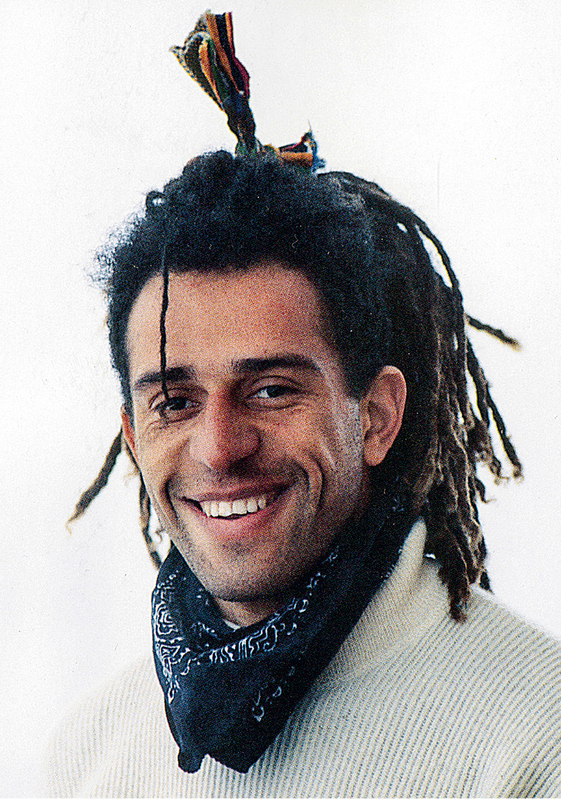 In the largely white French mountaineering community of the 1990s, Hugues stood out, but he proudly wore his ethnic identity in a thick mane of dreadlocks. 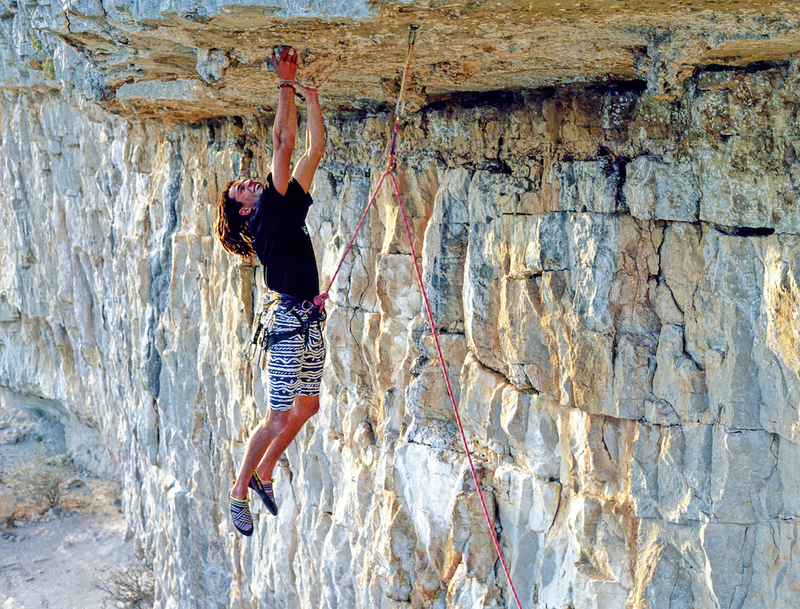 Because of his hairstyle and his love of reggae, climbers nicknamed him "Le Rasta." Indeed, Hugues followed some aspects of Rastafarianism, maintaining a strict diet, avoiding alcohol, and seeking a lifestyle of peace, though he didn't smoke marijuana. "He made fun of what other people thought of him," Laure Lobier recalls, "and yet he respected everyone. His philosophy was never to harm anyone or anything." During the 1950s, Hugues's father, Raphael Beauzile, had traveled to France to study, and when the Haitian dictator Francois Duvalier rose to power, Raphael found himself unable to return home. Remaining in exile, he met his wife, Nicolle, at the University of Poitiers, and the couple had three children: Fabienne, Hugues and Helene. Upon graduation from dental school, Raphael learned that he couldn't practice his profession unless he became a French citizen—a step that he didn't feel ready to take since he was still deeply attached to his country of birth. Instead, when Hugues was six years old, the family moved to the town of Bouafle, in the Republic of Cote d'Ivoire (Ivory Coast), where Raphael could work as a dentist at the hospital, while Nicolle taught at a middle school. Free to wander, Hugues ventured into the forests and the savannah with the local children, looking for wild antelopes, and exploring the edges of the Marahoue River in a wobbly dugout canoe they'd built themselves. Fabienne remembers how her brother learned to watch out for the dangers of crocodiles and hippopotamuses. "He had to respect nature to guarantee his safety." Sometimes, she says, Hugues brought his adored little sister along, and he swore her to secrecy about the time their canoe overturned. At age fifteen, Hugues returned to France to continue his secondary education. He lived with his aunt in Nantes, and then moved to Poitiers and Chatellerault, where his family was reunited once his father decided to become a French citizen. For the first time, in his own country, Hugues confronted the prejudices that surrounded young men of African origins. Mistaken for an immigrant, he was often asked to produce his ID, and at times, he was turned away from nightclubs that he tried to enter with his white classmates. "It was brutal for him," Fabienne says, "He wasn't expecting it. Coming from a rather privileged and sheltered background, he didn't have the reflexes." Her brother was naturally charismatic, she remembers, and he responded by building strong communities of like-minded friends, where he felt insulated from the rest of society. In Poitiers, he became close with a fellow high-school classmate, Laure. The two would remain together for the rest of his life. AFTER HUGUES COMPLETED HIS MILITARY SERVICE with a troop of parachutists in Bordeaux, he went to the Mediterranean town of Montpellier, where Laure was enrolled at a university. With little money to spare, the couple worked part-time jobs and biked around the city. Hugues's devoted French grandmother helped pay their rent and listened to him talk about his future dreams. He'd long wanted to pursue some kind of career in sports. In school, he'd trained for half-marathons by running alongside the bus, and he'd excelled in tennis and track and field. After a knee injury forced him to look for a new vocation, he happened to watch Patrick Edlinger's free-soloing film La Vie au Bout des Doigts. Moved by the natural grace of Edlinger's dances up the rock, Hugues began exploring the nearby limestone cliffs, searching for ways to express his own visions of beauty. One day, at a local crag, he paused to chat with a stocky, grey-haired man who showed up alone almost daily, self-belaying on sport routes while his dog waited at the base. The man was Lucien Berardini; the other climbers affectionately called him Lulu. More than thirty years older than Hugues, Lulu had participated in some of the most famous alpine climbs of the 1950s: the first ascent of the West Face of the Aiguille du Dru; and the first ascent of the South Face of Aconcagua, where he and four of his teammates had all lost toes to frostbite. Hugues became entranced by Lulu's raucous stories of adventure and by his refusal to settle into some soft couch for a quiet old age. "We like him exactly the way he is," Hugues later wrote in Vertical, "lively, alert and thundering." A deep bond formed between the pioneering alpinist and the young sport climber, and they spent nearly every day together. "What united them was their freedom and their love of nature," Laure recalls. "Hugues loved Lucien. Everything he did, he did with all his heart, just like Hugues." To Lulu, the younger man seemed like a son, and he guided Hugues's interests in climbing like a proud father. To begin with, he told Hugues and another young friend, Pierre Rouzo, about a wild ochre and orange cliff some thirty kilometers north of Montpellier—an area that came to be called Claret, after the nearest town. Previous climbers had mostly avoided the place: the limestone seemed too loose, the giant roofs too daunting. "A crag of the future," Lulu called it. To Hugues, the swooping overhangs and surreal columns appeared like the geology of another planet. "Here the imagination has power," he recounted. Birds flew out of holes in the rocks, and Hugues took care to avoid disturbing their nests, shuddering whenever the clink of his gear woke a baby crow. He thought carefully about where to place each bolt, trying to create an ideal experience of aesthetic movement and airy commitment. Some visitors complained about the runouts, but Hugues explained that he and his friends tested every fall, again and again, to make sure that no one's life would ever be in danger. Names of routes reflected his convictions, from Africa United, Martin Luther King, Rasta Revolution and Harlem Renaissance, to "Sekombien?!!! "—the latter intended to resemble the French question, "C'est combien?" or "How Hard Is It?" making fun of climbers too focused on grades to notice more important things. After obtaining his certification as a climbing instructor, Hugues opened a club with Laure to teach young students. His family loved the idea of Hugues becoming a teacher—his grandmother, his mother and his sisters all worked in education—even if Hugues's subject wasn't a traditionally academic one. Moreover, Fabienne says, they were proud "because Hugues emphasized the necessity of solidarity and mutual assistance, and he also taught children for whom climbing would have otherwise been financially impossible.... He wanted to share his passion, which was in accordance with our family culture." Called Scalata Nature, the school will celebrate its twenty-fifth anniversary in 2018 with more than 100 members. Arno Catzeflis, who runs the club today, has vivid memories of the man who taught him to how climb at age thirteen: "His Rasta-rebel side captivated me. The first time he belayed me, I took my first headfirst fall on one of the new routes of Claret. It was a 6b, my maximum grade level at that moment. Despite my fear, I didn't feel anything, and he said to me: 'You see! You aren't dead!' I will always remember that fall, which permitted me to free myself from my fear." To his more than fifty students, Hugues encouraged an ethos of living in harmony with wild places. At Claret he insisted that those who trained there not only keep it clean, but also support the community with mutual respect and common courtesy. "The whole group was intransigent on a minimum," Laure recalls, "that people say bonjour, that they pay attention to nature...and of course not throw trash or cigarette butts on the ground." Eric de Leseleuc—a mountain guide and professor who wrote a book about the crag, Les 'Voleurs' de Falaise—recalls that Hugues and other route developers envisioned Claret as an alternative world, a well-guarded utopia with values opposed to those of dominant modern culture. Claret will never be a supermarket, a factory or a gym, they explained. "That was their grand philosophical axis," De Leseleuc explains, "that at Claret, people should not be isolated from each other. People shouldn't go there just to consume climbing, but to create a social bond. This went with the idea of anti-consumerism: you didn't go there to consume nature, to destroy nature, you had to have a different kind of relationship. A relationship between people and also with the natural environment." In an age when so much of climbing had become heavily influenced by media, Hugues and his friends wanted to protect the sense of the personal and the private in their experiences; they avoided promoting themselves, and they only gave in to the idea of printing a Vertical article and a topo when they realized that otherwise someone else would do it first. 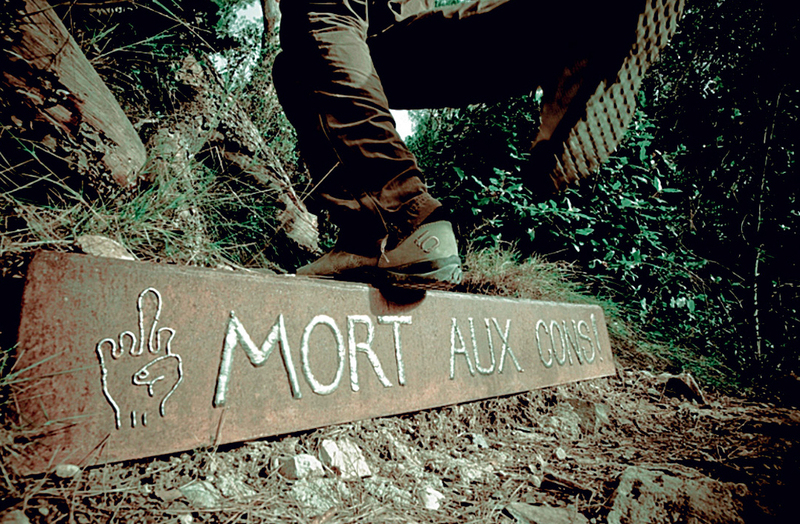 Regulars at Claret shared a common saying: Mort Aux Cons! Translated literally into English, it means something like "Death to Jerks." Local climbers explain that it wasn't about literal violence; it was a kind of metaphorical, absurdist expression that Lulu used to counter those who refused to accept the philosophy of the place. "Hugues, Pierre and Lulu and the group had inscribed this provocative slogan on a wooden stairway on the approach path," Arno says. "This step was removed several times by people who didn't have a sufficient sense of humor or perspective, and perhaps felt targeted by it." OVER THE YEARS, HUGUES WOULD ESTABLISH 135 of the 200 sport routes at Claret. Yet as he listened to Lulu's stories of the "golden age" of 1950s French mountaineering, he became eager to experience that world of bold alpinism for himself. 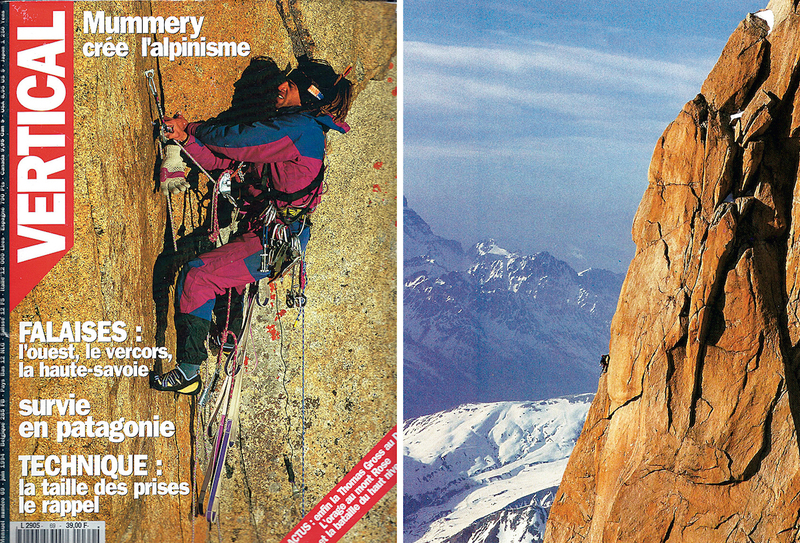 In the summer of 1992, the two men traveled to Chamonix where Lulu took his young protege on his first mountain routes. Hugues set his sights on the Walker Spur, an elegant and iconic 1200-meter line on the shadowed north face of the Grandes Jorasses. Since Lulu could no longer climb the route with him, Hugues made up his mind to solo it that winter, when the cold would freeze the loose stones on the wall. In an effort to dissuade him, Lulu introduced Hugues to one of the top young climbers of the day. But instead of trying to stop Hugues, Fred Vimal lent him his own rope and skis. "The personality of Hugues was such," Laure explains, "that when he had a project in his mind he could make the whole world share it; he could make everyone dream." He set out for the route in early February 1993. Intending to move fast, he carried only eight cams, four pitons, some slings, a self-belay device, an emergency blanket, a bivy sack, a pair of gloves, a puffy jacket, a waterproof shell and pants, two energy bars, a tube of condensed milk, a package of fig cookies, a stove, one fuel can and a borrowed radio. With no experience as a skier, Hugues struggled through the approach on ill-fitting equipment. By the time he reached the base, he was exhausted. But as he began to climb, his spirits lifted. "I continued without asking myself too many questions," he later told the journalist Jean-Michel Asselin, who included him in a Vertical article on winter solos, "except that I found the pitches difficult and I often had to search for the way." After Hugues lost his bivy sack to a gust of wind, he stayed awake, constantly moving his arms and legs to keep from freezing to death. When his fuel dwindled and he could no longer melt snow for water, he sucked on icicles. As a blizzard pounded him on the third night, he resigned himself to calling for help. It was only then that he discovered his radio didn't work! The next morning when he heard the thwap-thwap-thwap of a helicopter, Hugues thought someone had come looking for him. He didn't find out until later, that, by coincidence, the famous French alpinist Catherine Destivelle was climbing below him, in the midst of making the first female winter solo of the route. As photojournalists passed overhead, they snapped his picture wondering, Who was this brave soloist? In search of shelter, Hugues pushed on over the summit in the fading light and down the other side of the mountain into Italy. At the Boccalatte Refuge, he found a candle to melt some snow and a stash of cocoa powder, which he devoured ravenously. When he woke, he discovered his feet were too frostbitten to fit in his boots. He tried his radio again and successfully reached the Italian authorities, who sent a helicopter. The rescuers gave him a warm hat and a pair of socks and brought him to the tunnel where the road runs under Mont Blanc back to France. Lulu was waiting with a car. "I cried when I saw him," Hugues told Asselin, "and he took me to the hospital." The Walker Spur ascent instantly put Hugues on the climbing scene in a big way. The third person to climb that route alone and in winter, he'd done so in an astonishingly minimalist style and with very little preparation. Some people thought Hugues was crazy or merely lucky; others considered him a prodigy. Lulu felt anguished at the risks Hugues had taken. Yet to the climbers of Claret, the achievement also seemed to flow naturally from Hugues's strength and technical skill, from his ability to control his fear—all qualities that he'd honed at their crag. Relieved that his frostbite didn't require any amputations, Hugues sent a photo of his intact toes to his worried mother, "carefully numbered," Fabienne recalls, "so she could see they were all there." But he didn't seem to grasp how remarkable his accomplishment was to other alpinists. "I just set off there as if I were going to do a hard route at Claret," he said to Asselin. "I thought everyone did that sort of thing! I was at my limits, but I like to push myself." Looking back, Laure says, "I think he really loved that first adventure. It became a beautiful success in the end. And I think that all at once, that confirmed the choice of commitment that he always had afterward." LULU AND HUGUES traveled next to North America, where the young man could train on granite big walls. On the Nose of El Capitan, Hugues led for forty-eight hours without sleeping, moving as smoothly as possible so as not to wake Lulu, whenever his older partner dozed off at the anchor. In search of more experience, Hugues rope-soloed the Zodiac Route, and the pair continued on a tour of other national parks. Later, his older sister remembered how he spoke of finding a "sense of space, of solitude and communion" in the immense landscapes of the West. After his return to France, on New Year's Day, Hugues planned an even-more ambitious solo: the immense Tomas Gross route on the West Face of the Aiguille du Dru. First climbed in 1975, the route still had an aura of mystery and inaccessibility. Once more, though Hugues prepared quietly, he found himself on the edge of a sponsored climber's story: Marc Batard, who intended to establish a new route nearby. For months, cold waves of blizzards rolled in over the Alps. Batard gave up after rockfall destroyed his tent. On his first attempt, Hugues found himself stuck on a slab of snow-covered granite. Unable to climb up or down, he jumped to a ledge, sprained his knee and dislocated his hip. During his second try, weeks later, a loose block of stone came off in his hands, and he fell again; his leg was sliced open so deeply he could see the bone. He bound the wound with medical tape. "Seeing as I hadn't broken anything, I didn't worry," he later told Asselin; only after forty-eight more hours of storm did Hugues resolve to descend. On March 24, Hugues headed back to the wall with Lulu. Soon, the two friends stood together below the same burnished, snow-streaked rock face where Lulu and his partners had climbed the original route in 1952. "There, he left me," Hugues later told Christophe Raylat of Montagnes. "There was no need to talk. A look was enough. We understood each other." This time, Hugues brought a month's worth of food. For days, he kept going through a dense frozen mist that blurred earth and sky and numbed his feet. Through the clouds, he passed signs of others who had failed: an old bag of food, clusters of tattered slings. He wondered about the first ascensionist, Tomas Gross, who'd vanished in India, a few years after completing the route in eighteen days with only a guitar for company. At last, Hugues awoke to clear skies. "My rhythm accelerated," he recounted to Raylat. " The two big overhangs offered to me the absolute joy of the void.... My head spun. And there I was, almost without noticing it myself, two pitches from the summit. It was then that the tempest arrived. Three days of fury and anguish." At night, a gust flipped his portaledge, and he woke in a state of panic, dangling upside down in the air. By 5 a.m. April 4, Hugues realized he had to escape, and he continued onward through the storm. "The rest was only violence and a battle for survival," he said. From the summit, he headed immediately for the descent couloir. Snowdrifts buried the anchors, and repeated slides almost swept him away. He fell into a chasm up to his neck and dragged himself out again. Since that morning, he'd kept himself going by imagining that Lulu was somehow still there waiting for him at the base of the couloir. As dusk drifted over the mountains, now, he saw the slope was empty. Hugues put his skis back on and struggled to make turns down the steep, thick snow. To Raylat, he recounted his arrival in town like a dream: In the middle of the night, a disheveled Rasta arrived in Chamonix. His skis on his shoulder, his pack on his back, his headlamp on a head turned white with frost, his hair like icicles. The first living thing: a man. Ten days of solitude had been sufficiently long to forget some social codes. I called out to him. He couldn't restrain himself from making a step back. There was a kind of shift in the atmosphere.... I asked him with my most reassuring smile: "Do you know what time it is? What day?".... The man quickened his steps, leaving me to pursue, with a little sadness, my nocturnal wandering. Close to me, I sensed the soul of [Tomas] Gross. When the community of Chamonix woke to what Hugues had accomplished, people were stunned. He'd made the second solo ascent of the daunting route in nine consecutive days, about half of which he'd spent stormbound in his portaledge. Beyond the giant overhangs, the only traces of previous climbers he'd found were those of Tomas Gross. Philippe Fragnol, one of the photojournalists covering Batard's attempts, had captured an aerial photo of Hugues, and the editors of Vertical ran it on their cover. Olivier Meriaux, the Secretary of the Club Alpin Francais of Avignon, wrote to the magazine, "I can say only one thing: hats off.... I hope that other people can appreciate the real worth of the quality of this feat, as much by its technical level as by the rigorously irreproachable means." In Montagnes, Mario Colonel predicted that brilliant young alpinists such as Hugues, who got their start at crags, would mend the schism between sport climbing and alpinism and prove that the two genres "belong to the same family." For Hugues, the climb had another, deeply personal meaning. As he'd read books about Lulu's ascents, he'd wondered whether he'd know when he'd crossed the line between possibility and impossibility. "He felt an immense joy," Laure remembers. "Until then, he hadn't been sure, psychologically, if he was capable of retreating.... He told himself, I'm really an alpinist; I know how to turn back." Months later, in January of 1995, he and Lulu traveled to South America with plans of climbing to the summit of Aconcagua. It would be the start, Hugues hoped, of a future that would lead him, one day, to the golden granite spires of Central Asia and the sun-dazzled big walls of Africa. At the time, Lynn Hill questioned her own willingness to accept the risks of high-level alpinism, and she'd asked Hugues why he felt so driven. "I find great satisfaction in tapping into a kind of elevated state of consciousness during those crucial moments of difficulty," he told her. "The greater the challenge, the more inner strength I'm able to access." 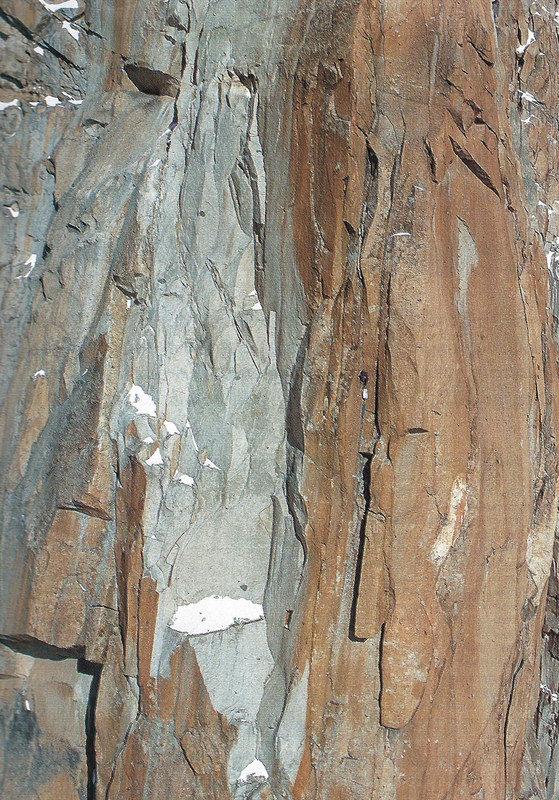 THE 1990S WERE AN ERA of great exploits in French climbing, but also of great risk. In a March 1995 editor's note for AlpiRando, Sylvain Jouty observed that climbers who survive dangerous ascents often become praised for "boldness," while those who die get judged for "rashness"—a contrast that seemed questionable to him, when "the threshold between the two is more than tenuous." Some might claim that Hugues had ventured too high, too far, too fast to avoid a horrible collision. But those who knew him well, his many friends at the crags of Claret, would likely disagree. Hugues had no grand ambitions for fame and glory. Nor did he climb to aggrandize himself. His desire for mountains seemed to come from deep within his soul. "What I really remember most about him was his sweetness and his integrity as a person," Lynn Hill told me. "The way that he climbed and the way that he created the Scalata Nature, he was a real community participant. He took money out of his own pocket to fix the routes that he did. He wasn't greedy. He would probably give you his last nickel." Could that spirit of generosity have influenced his fate? When Hugues and Lulu arrived below Aconcagua, new-fallen drifts blanketed the South Face, and avalanches rumbled. Lulu suggested climbing the normal route on the north face to acclimatize and return when conditions were better. Hugues told him to go ahead: he'd rather remain below the South Face until the snow settled. Days later, when Lulu returned to the south side, he found a note from Hugues in their camp: rather than wait, he'd decided to climb the face alone. Laure recalls that Hugues brought plenty of food and supplies, "everything that he needed." On January 20, he rose at 4 a.m. and by evening, he was already one-third of the way up the face. In his diary, however, he wrote that his knee troubled him again, and he wasn't sure that he'd adapted enough to the altitude. A day later, he wandered off route and ended up hanging from a single piton for the night. Still, he hoped to reach the summit in two days—a descent of the complex, avalanche-prone face was becoming too hazardous. From the top, he could access the relative safety of the normal route, where he would find easier terrain, shelter and other climbers. On January 22, his birthday, he dragged himself, exhausted, up slopes of ice and snow, sinking to his knees. "Today, many people are thinking of me," he wrote, "so before going to sleep, I'm going to try to think about everyone. The night will be long. Everything is damp." By January 23, he thought the best choice might be to abandon most of his gear and make a rapid push for the summit. Then he looked down: two Corsican climbers, Pierre Griscelli and Celine Rambaud were "in the midst of suffering where I had suffered the day before," he wrote. "So, instead of continuing a half-day, I waited.... The fact of suffering together gave me my morale back, even if the problem was the same." On a snow-encrusted pillar, forced to stop and dig for each hold, they lost more time. Hugues's extra food, divided among the group, ran low. Then there was no more fuel to melt water. Pierre started to vomit. Their only option for survival lay beyond the summit. "It must be done," Hugues wrote simply. Incapable of giving up hope, he persisted, leading his companions past wind slabs, until at last, exhausted from the effort, he could go no farther. IN JANUARY 1997, LULU ACCOMPANIED Nicolle and Fabienne Beauzile up the stony paths below the South Face to a blue alpine lake, where they stopped to scatter Hugues's ashes. "We saw the crushing presence of Aconcagua above us," Fabienne remembers. Back at Claret, the local climbers had dug into the hard, dry soil at the crag to plant a Himalayan cedar. Again and again, they carried jugs up the steep approach trail to make sure that the tree received enough water. It became a ritual, Eric de Leseleuc recalls, to honor a man who had given generously of his time, of his passion, of himself, in pursuit of beauty and community—who showed a belief in what might be possible with abundant offerings of enthusiasm, integrity and joy. During those final days of struggle on Aconcagua, Hugues and his new partners had become close. "We never abandoned each other," Celine says, and she imagines telling Hugues now, If only you had lived, what a beautiful and strong friendship we would have known. When Lulu returned to France, he told the journalist Charlie Buffet that he felt haunted by the loss of the man he considered his spiritual son. "I spent my time saying if, if, if. If I hadn't left him at base camp, if I'd known how to teach him patience." Before giving Hugues's journal to his family, Lulu had typed out a copy for Laure, which included his last words for her: I embrace you. By 2007, both Lulu and Pierre Rouzo had died of illnesses, and the cedar withered. So members of the Claret community planted three olive trees in memory of all three friends. Each year, in early October, Hugues's students gather for a reunion below the trees, raise a glass and watch the rising moon illuminate the wild sweeps of rock. Today, Nicolle says that, at times, she feels her son's presence even more powerfully than when he was alive. Of course things have changed since the beginning of the site, customs have evolved, and we have entered into a globalization of climbing, in which people consume routes as if they're eating a bad cheeseburger.... [But] Claret is not a conventional crag...not climbing of business, but of real passion.... To share a little secret: in immersing yourself in this crag, you will perhaps feel the spirits of its creators.... They gave life to three olive trees that grow on the little trail beneath the roofs. It seems that certain evenings, at dusk, after the departure of the last climber, when the calm of the night falls on these places, little laughs resound...and the trees shake.... It's the force of the soul.